Getting a manicure is one of the best ways to pamper yourself — but if your nails are thin, peeling, and cracked, one of the most enjoyable experiences becomes anything but. After all, nails that aren’t in tip-top shape aren’t exactly #ManiMonday worthy. Or, if you’re a guy or the naked nail type (hey, no judgments) it can be frustrating, or even embarrassing, to have nails that look so distraught. And you’re not alone! According to medical research, nearly 20% of the world population suffers from weak, brittle nails. But why the heck are your nails breaking so easily? Below, we’ve rounded up the top causes of weak and splitting nails… and what to do to strengthen yours. Gel manicures look gorgeous, and they last longer than traditional ones, making them a great option for vacation. The thing is, they’re not so good for the health of your nails. In fact, they can actually lead to brittleness, peeling, and cracking. 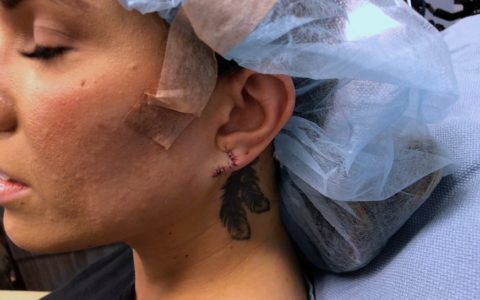 It’s not exactly the gel polish that’s to blame — this type of manicure has to be removed with acetone, which is also weakening. Plus, nail technicians will scrape and file and attack your nails pretty dramatically to attach and remove all that gel, which isn’t great for your nails, either. The fix: If you have a standing appointment at your nail salon, take a break and let your nails breathe between gel manicures. Switching to traditional nail polish may also help. Finally, keep your nails moisturized between gel manicures by regularly applying lotion or oil to your nails and cuticles. Peeling off polish (whether gel or traditional) when your manicure starts to chip isn’t just getting rid of a pretty coat of polish. You’re also removing part of the top layer of your nails, leading to thinning. Hey, we’re all guilty of doing this from time to time, but we’re just here to warn you: your nails will suffer. It can take months for your nails to grow back healthy. No thanks! 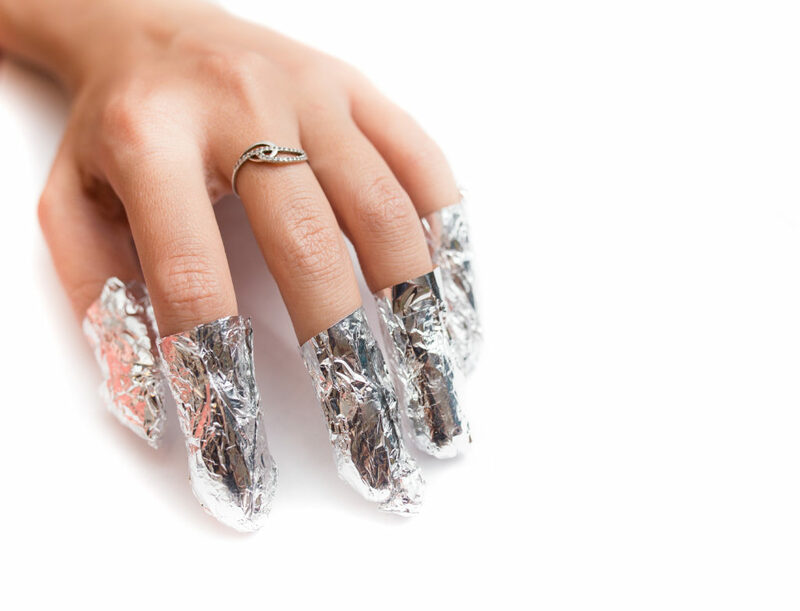 The fix: Do not, we repeat, do not peel off your nail polish. Try a non-acetone polish remover to take off traditional nail polish without weakening them any further. Cleaning your kitchen and bathroom is a necessary chore, but repeated, prolonged exposure to chemicals found in cleaners as well as soap and water could be weakening your nails, leaving them brittle and prone to splitting. The fix: This one’s easy — throw on a pair of rubber gloves before scrubbing. This will prevent chemicals, soap, and water from touching your nails (and skin!) while you clean. Sometimes, breaking nails is caused by a vitamin or nutrient deficiency. The most common one is vitamin B7, and there’s a water-soluble version you might have heard of: Biotin. It’s important for the health of your hair, skin, and nails, which is you may have heard of it specifically when it comes to these types of supplements marketed toward women. There’s validity there: Biotin helps our body to convert the food we eat into glucose, which is what our body uses to produce energy. Biotin also helps us create the building blocks of protein — fatty acids and amino acids — and activate the metabolism in the roots of our hair and the cells of our nails. 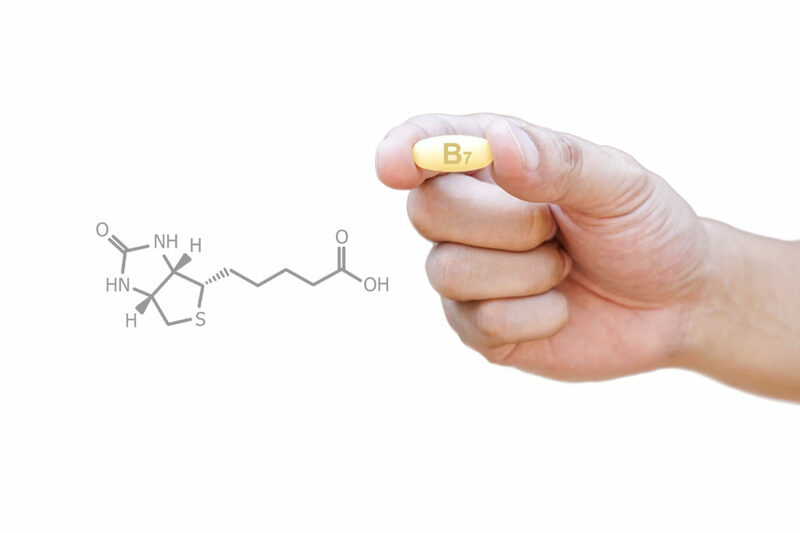 The fix: Another easy solution — add a biotin supplement to your daily vitamin routine. The daily dose to treat brittle nails is 2.5-5 mg a day, and there are tons of options out there, from traditional horse pills to sugary gummies. 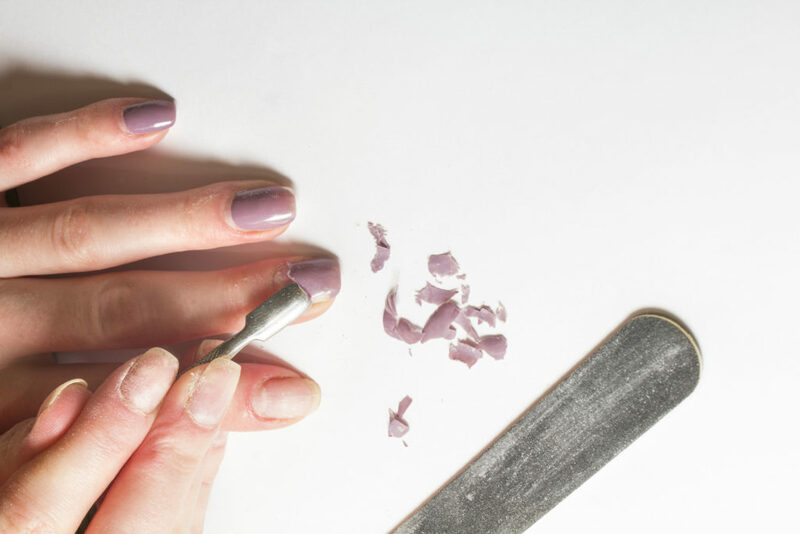 If you tend to use your nails to scrape, peel, or pry things off, then you leave yourself open to breaking them. Hey, we get it. 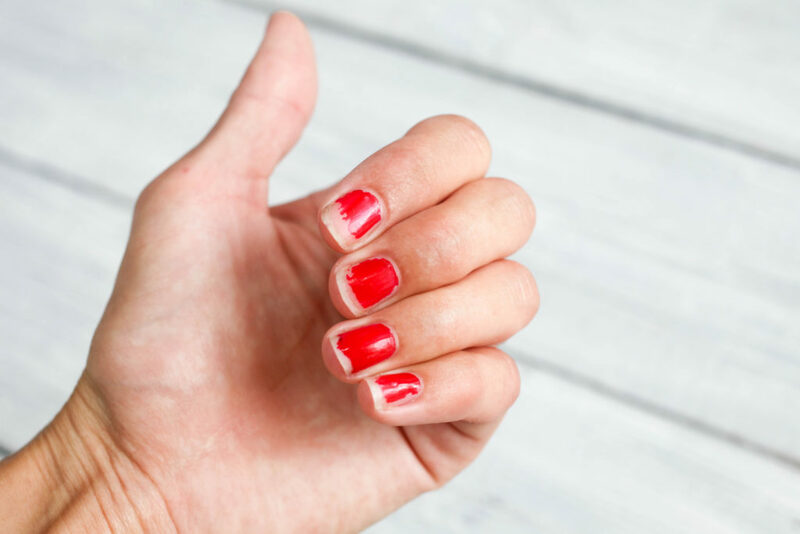 The fix: Well, it’s sort of a duh, but we’re here to encourage you to use actual tools, like scissors, for prying, peeling, or scraping, instead of your nails. 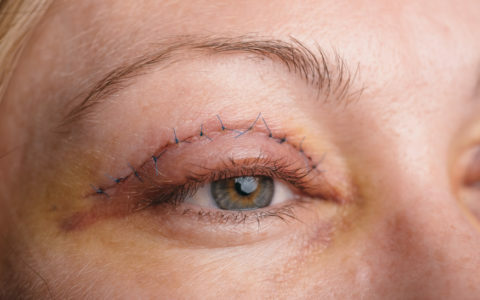 Keep them cut short to prevent further injury, too. You can’t stop the hands of time, and sadly, nails often become thinner as you age. 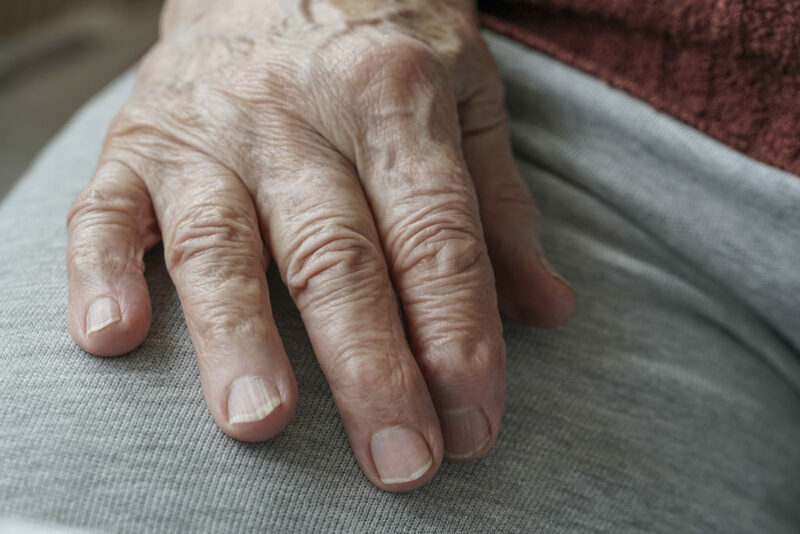 According to a study published in the journal Canadian Family Physician, brittle nails are common, and more frequently found, in older people. 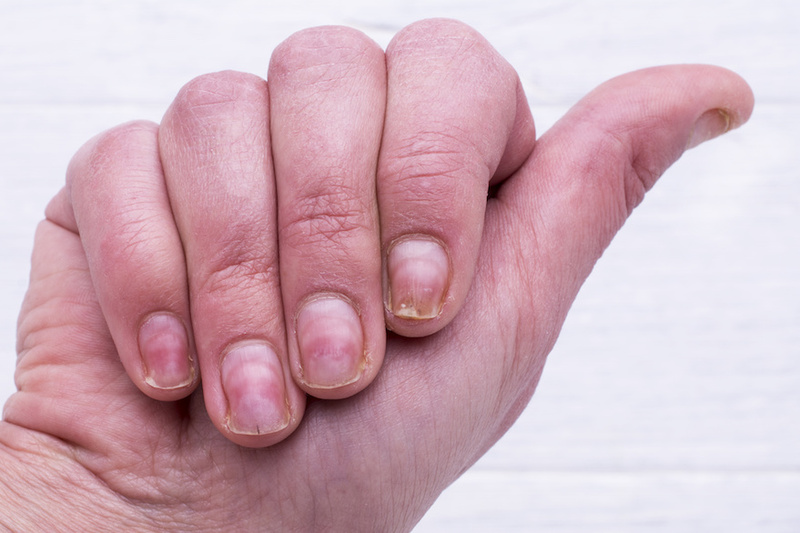 The fix: Apply a nail hardener to strengthen thinning nails caused by aging, and take some of the other measures we’ve already mentioned here, like laying off the gel manicures from time to time, wearing gloves when cleaning, making sure you get enough biotin, and using hand lotion or cuticle oil frequently. And with that, we’re confident your nails will be strong and crack free in no time!